Poll: Would you use an electric car to tow your caravan? Electric cars are not only improving in terms of their pulling power on the road, but also off the road they’re moving up the popularity stakes. And the good news for caravanners is that some hybrid electric cars can now tow a caravan effortlessly, as well as being heavy enough to keep a big twin axle caravan in check – some with a greater kerbweight than their diesel or petrol counterparts. They’re also cheaper when it comes to fuel consumption, plus more and more supermarkets and service stations have those necessary charging stations. Caravanners can also take advantage of a campsite’s electric hook-up to give an overnight charge! The only concern is the mileage you’re able to cover between charges, but manufacturers are making upgrades all the time. So, in our latest community poll, we’d like to know if you’d consider using an electric car or an electric hybrid car to tow your caravan? Vote using the buttons below. Feel free to leave your thoughts about electric and hybrid towing in the comments box below. Having studied the comments Electric vehicles are not fit for purpose yet, as who would wish to get into a vehicle with a caravan on tow with there family also in the car with the responsibility of getting them to a campsite, with where will I have to plan to recharge the batteries, and will there be enough charging points, will I have to wait while other people are charging their vehicles, it maybe more environmentally friendly but the stress it can cause gives me the feeling it’s not worth the hassle, as the people that was in charge of the country not too long ago steam was a great fuel, petrol was the way to go, diesel was the best non pollution fuel, it’s never ending with who knows best stick to what you have, life is short enough without the worry of who’s right who’s wrong,, if you are happy with the towing set up you have, keep it till we have to change because your car will have gone by its sell by date anyway. Had a Hybrid DS5, as I travel long journeys my Fuel consumption was worse than my much faster Diesel only BMW. Yes they are great for nipping to shops but long journey or put under load and battery will be drained in no time. We are still some way off cars that will charge quick enough or simply having enough charging stations to be viable. Sure Tesla and Porsche’s Mission E now offer long range and fast charging if you have £80K to £100K+ to spend. On a recent test with a Model X towing 1260 Kg used an average of 613 watt hours per mile making it very challenging to find charging stations in time. I am not saying nether, just don’t think they are advanced enough yet. I will stick with my diesel RR sport. Yes it’s expensive to run bit still cheaper than an electric. Plus it will soon gain in value as a collector rather than depreciate quickly like an electric car. Also these electric cars are no good stuck in a snow drift for 10 hours. We are a LONG way from turning electric. Better off investing in hydrogen fuel. That I would consider for sure. The range of the best electric cars, especially those capable of towing a 1.4 ton caravan, is limited. The range whilst actually towing a caravan … well, I doubt it would get my van as far as the gates of the storage yard! Technology has a long way to go before towing with an electric car becomes a realistic prospect. The issue is … will caravanning survive the wait? When electric 4x4s will give me 250 Brake hp and 450 lbs ft of torque allowing me to tow my 2Ton van I will buy electric. But I think this is a long way off and certainly not possible in my life time. Till then I’ll stick to my Trusty Diesel . Volvo V60 pulls 1800KG, Tesla 2250KG but if your caravan is seriously heavy, best EV for towing is Bollinger which can tow more than 2,750KG. I’m a bit fed up with adverts saying electric cars are carbon neutral, untill we stop using fossil fuels to generate electricity this is not the case! My diesel car is serviced and maintained, driven carefully extremely economical and tows the van without putting a strain on the engine due to good set up. Towing well below the max means I don’t have to rev the engine, or flog it up hills unlike some of the lorries on the road who have many a time slowed me down up even the slightest incline. I don’t feel I’m a luddite in any way (I work in IT for goodness sake!) but I just do not understand the whole argument about Petrol / Diesel / Electric cars. Until they sort out the method power is generated (not just on the small area of the UK but across the world) how can electric be any less polluting than diesel (which many power stations use to run their generators) or petrol. I have not kept up with battery production or expected longevity but making and scraping batteries wasn’t that green last time I heard from an independent source INDEPENDENT being the key word here as Elon Musk wouldn’t tell you the truth! As for towing with a purely electric car – GET REAL! I am finding that many car supplies seem to be holding out on relevent information on hybrid and electric vehicles. Especially if one is looking for a new tow vehicle. The New Tesler is out of reach money wise but delivers good milage. Just can’t seem to read any information on New Hybrid vehicles and at what speed does the fuel engine kick in from electric. Is it still 30mph. 50mph would be desirable. The Toyota Purus 7 seater estate can’t be fitted with a towbar and I didn’t like the look of the Rav. Not sure about the Mitsy Outlander after speaking to an owner about towing milage, not much better than a desiel I was told. The VW GTE 1.5 Passat Hybrid Estate looks interesting but I couldn’t find any info on it’s towing capability and what is all this BHP now PS. I feel like someone is trying to confuse us all. Nissen have the Leaf but as nothing bigger and what are Fords doing. Volvo ads and BMW appear to be forward thinking. No one is advertising their Hybrid vehile is good for towing caravans. Someone is missing a trick. As a Caravana I would need a Hybrid, who wants to run out of power in transit. Most adverts are still pushing desiel vehicles! Can’t say I’ve seen any electric vehicles with solar panels on them and no mention of wind charging devices. Currently towing with a petrol Mondeo 210 BHP 2.0ltr. As most people have pointed out, they are not ready yet , however I would have an electric car when there is one which meets my needs, however the manufacturers are not manufacturing what I am after (I currently use a sharan because I need something big enough to fit my wife’s mobility scooter and our two children comfortably and tow the caravan!) The other consideration is I am unable to charge at home. So while I voted yes, because I would love to have and tow with an electric car, currently it is impractical for me to do so. This is surely a loaded question inasmuch does the breed yet have the grunt to level out berms? That would be my concern (and line of research) for a first point to make: will you “collect” a tailback when touring on non-dual roads? The caravan is beginning to lose the reputation of holding up “hurriers” on road (and especially where there are lumpy bits) so would the touring community begin to attract social media Twits who love to do a negative at the drop of a gear. Someone has to leave the charge though so all media messages about e-towing are going to set the tone, and will certainly be watched by vehicle producers. No they haven’t got the range required charging points are not readily available. I am dubious about their green credentials as battery’s are notoriously hard to recycle, how long will they last can we trust manufacturers figures. If Vw are anything to go by then no. I voted to have an electric tow vehicle and will have one when it can tow as much and have the range (300+ miles, towing, have seven seats and be the same size as my Volvo XC90. Oh, and it has to do the same job solo as the Volvo……. go anywhere and be unstoppable……. When I can fly from England to America in and electric powered plane, I will consider and Electric Car. as a pensioner i could not afford one. i will stick with my diesel powered tug because when electric cars are powerful enough and have the range i will probably have cashed my chips in or no longer able to drive. 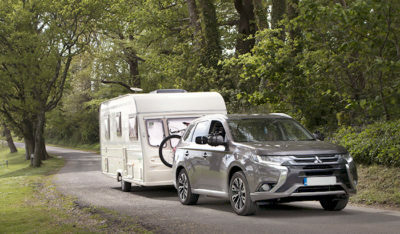 We already use a Mitsubishi Outlander hybrid for towing. Do the calculations carefully and realistically. Don’t expect 25 plus mpg when towing, but likewise do expect 80plus mpg equivalent on local driving! We have solar panels, so a small degree of help in sunshine. Use an energy supplier that will guarantee to source power from renewable sources. The technology is improving all the time. We towed a Bailey Verona until last summer when a 20 ton breakdown lorry wrote it off in France. Replaced it with a Bailey Brindisi for this year. Both have mtplm under the max of 1500 for the car. Be brave, think outside the box! No they will not be powerful enough to tow a caravan, as they really struggle when loaded up. Just changed my car to Mercedes GLC 250d so while I voted maybe it won’t be until they’ve evolved a lot further that current cars and come down in price due to volumes increasing and technology improving. All very well being able to charge up on site but useless for long trips especially on the continent and when towing a heavy 1800kg twin axle. When I see a 44 Tonne artic with an electric powered tractor unit up front I’ll consider an electric powered tow car. Maybe I’m a bit old fashioned, but diesel is the power unit with reserves of pure grunt to pull today’s heavy caravans. DC electric motors have exceptional torque but the more required the quicker the batteries are exhausted. Recharging is considerably longer than a fill up at the pumps. As a second non-tow car I’d consider electric though.